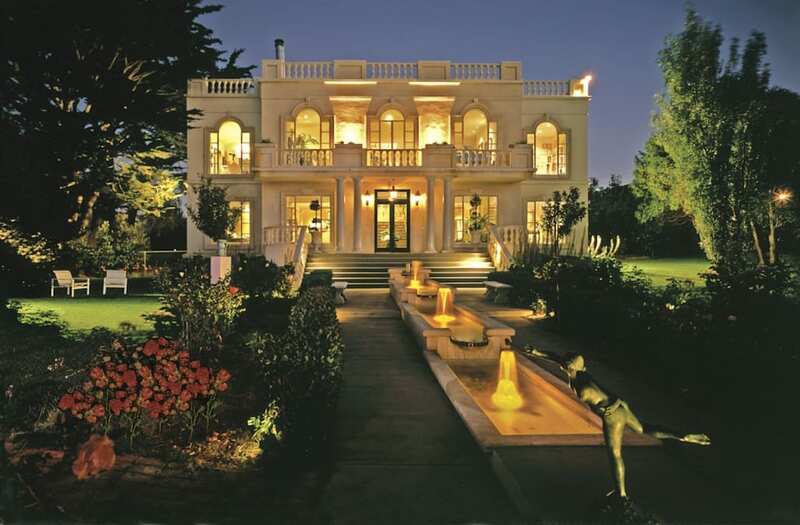 A mega-mansion that's fit for James Bond has hit the market in San Francisco. 47 Chenery Street sits on one of the largest private lots in the city, but passersby in the Glen Park neighborhood might not know it exists. The main residence is tucked behind a three-unit building located on the street (included in the price) and is surrounded by trees on all sides. 47 Chenery Street is hidden behind a row of modest houses in San Francisco's Glen Park neighborhood. People walking by 47 Chenery Street might not think much of its curb appeal. But there's more than meets the eye. Pritikin, a former ad man who claims to have named Google (but was never credited), accesses the compound through the three-unit dwelling on Chenery Street. Past the gates, the estate includes a five-bedroom, five-bathroom main residence, a garden cottage, and statue-laden grounds. The neoclassical facade lends a French country vibe. Pritikin is an avid art collector, and his home doubles as a private museum of oddities. The clock (right) that once hung above F.A.O. Schwarz in San Francisco resides in the foyer. He's got a needlepoint tapestry of George Washington surrounded by $1 bills; a wall-sized replica of Rembrandt's "The Night Watch"; and a $35,000 chair no one is allowed to sit in. Pritikin admits only close friends and the occasional busload of seniors, who pay for lunch and a tour, to his in-home museum. He estimated the value of his collection at $50 million. In the penthouse, stained glass windows salvaged from the former Little Sisters of the Poor Church reflect and sparkle off a 12-foot-by-20-foot indoor swimming pool. The glass roof over the pool is retractable. In 2009, Pritikin estimated he spends "a few hundred thousand" a year on landscaping and repairs alone. Those rooftop solar panels might help lower his electricity bill. You can't put a price on the city views. The listing price on 47 Chenery has dropped from $12.5 million to $11 million since September. Quirky estates like this one typically spend more time on the market. The neoclassical behemoth could be all yours.